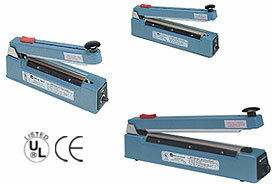 The Impulse Sealers with Cutters (C series) consist of 8, 12 and 16 inch models. All are equipped with a sliding blade that cuts excess material a quarter of an inch from the seal. The Impulse Sealers with Cutters are excellent in sealing poly-tubing and most plastic materials. Available in seals widths of 2 millimeter and 5 millimeter. Especially perfect for applications where roll bags or plastic tubing is used. Model: AIE-200C, 300C, 400C, 205C, 305C. This versatile, portable Impulse Sealer with dual timers, allows the user to pre-set the heating and cooling times. The user will have the ability to create consistent seals with unlimited variations in quality. When the sealing arm is lowered, an electromagnet activates, holding the arm down until the entire sealing cycle is complete. A built-in cutting blade allows the user to cut away excess plastic during this time. 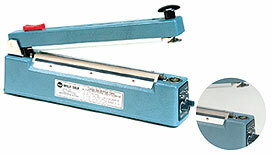 The impulse hand sealer creates a 5-millimeter wide seal. Seal Length 8 " 12 " 16 " 8 " 8 " 12 " 12 "
*All Sealers are 120 Volts (220 Volts Units Available Upon Request) CE Available on AIE-200, 300, 200C, 300C Upon Request. Included with all our Hand Sealers is a Relpacement Parts Kit (2 Heating Elements, 2 Upper Teflon & 2 Lower Teflon, cutter knife).